The Oregon Department of Agriculture and the Oregon Department of Fish and Wildlife announce that recreational crabbing is now open from the north jetty of the Coquille River to the Columbia River. 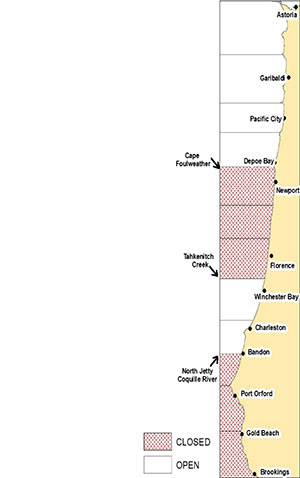 An area from Tahkenitch Creek (north of Winchester Bay) to Cape Foulweather (north of Newport) was previously closed due to elevated domoic acid levels. Recent crab samples taken from the area indicate these levels have dropped and remain below the alert level. This reopening of the recreational season applies to crab harvested in the ocean and in bays and estuaries, and on beaches, docks, piers, and jetties. Recreational crab harvesting remains closed along the southern Oregon coast from the north jetty of the Coquille River (including the Coquille estuary) to the California border. Below is a guide for what is currently open and closed for both recreational and commercial crab fishermen. Before crabbing, please confirm the status of ODFW/ODA harvest areas relative to concerns about elevated biotoxins at the website below. Recreational crabbing – Currently open in the ocean and in all bays and estuaries that are not under the health advisory. Commercial bay crabbing – Commercial bay crabbing remains closed in all areas due to the delay in the ocean commercial Dungeness crab fishery. Despite the commercial closure, crab and shellfish products sold in retail markets and restaurants remain safe for consumers. It is always recommended to eviscerate the crab and discard the "butter" (viscera or guts) prior to cooking. When whole crab are cooked in liquid, domoic acid may leach into the cooking liquid. It is recommended to discard the cooking liquid, and do not use it in other dishes, such as sauces, broths, soups, stews, stocks, roux, dressings, etc. The consumption of crab viscera is not recommended. For more information, call ODA’s shellfish safety information hotline at (800) 448-2474 or visit the ODA shellfish closures web page. Oregon Department of Agriculture map showing where recreational crab harvesting is now open in Oregon.